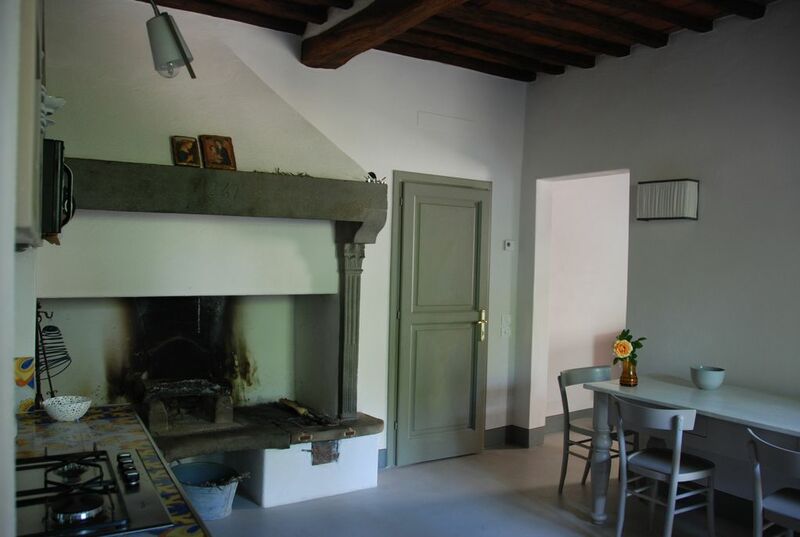 Kitchen with a fireplace of 1700, living room with sofa bed and TV, small studio overlooking the Chianti hills. Master bedroom and large walk-in closet, bathroom with tub and shower and double sinks. Private garden furnished with a table and chairs. Pergola overlooking the ancient church of Santo Stefano. Dishwasher, microwave, refrigerator, Internet access with wi-fi, 2 televisions, housekeeper on demand. We thoroughly enjoyed our stay in the tiny village of Montefioralle. The apartment is situated in the middle of the village with easy access to Greve. The local restaurants and winery are well worth visiting. The is also nicely situated between Sienna and Florence for easy day trips. The apartment was clean and had everything necessary to make a week stay comfortable. Romantic and relaxing. A beautiful home and location! Our stay in Danila’s home was wonderful. There was plenty of room for three of us. The house was spacious with everything we needed. The beds were comfortable and the location was perfect. We visited several wineries, enjoyed coffee and pastries at the nearby cafe and had lunch at the restaurant just around the corner where the food was delicious and the view spectacular. We couldn’t have asked for a more relaxing experience and would not hesitate to stay again. Ever wonder what it is like living in a Tuscan hilltop village? This apartment delivers the whole experience. The living space is comfortable, well appointed and large. Dining in the private garden with its variety of flowers, fruits and extended grape arbor is a pleasure. The neighbors and local caretaker are delightful, even though our Italian is terrible. The village of Montefioralle itself is small, but it boasts two restaurants serving lunch and dinner, a bar for coffee in the morning and drinks later in the evening, a local winery (reservations required for tasting) and a place that offers Tuscan cooking classes! Shopping for practically everything else is only 1.5 km away in Greve. Over the past 15 years, we have had the opportunity to stay in some really unique and beautiful places in Italy and this apartment just joined our list of favorites. Un très beau séjour dans un cadre magnifique. Une maison très agréable, spacieuse, très calme,très propre et soigneusement décorée. Un endroit propice pour se relaxer. Wir haben im Juli eine Woche in der Ferienwohnung von Danila verbracht. Die Ferienwohnung ist sehr geräumig und auch bei großer Hitze angenehm kühl. Zur Begrüßung stand Espresso,Tee, Wasser und Essig/Öl zur Verfügung, ansonsten gab es alles, was man so in einer Ferienwohnung benötigt. Montefiorale ist ein idyllischer Mini Ort auf einem Hügel,der von Greve (Einkaufsmöglichkeiten, Restaurants, Marktplatz...) in 1,5 km (und 100 Höhenmeter) mit etwas Anstrengung auch zu Fuß zuerreichen ist. Die Vermieterin war sehr freundlich, ein fehlender Sonnenschirm für die Terrasse wurde sehr schnell besorgt. So konnten wir auch das Frühstück draußen genießen. Man erreicht von Greve aus viele schnuckelige kleine Dörfer, aber auch die sehenswürdigen Städte wie Siena und Florenz sind schnell zu erreichen. Also mitten in der Toskana, wie man sie von Bildern kennt! Wir können die Wohnung auf jeden Fall weiter empfehlen. Man ist allerdings nicht mitten im Trubel.